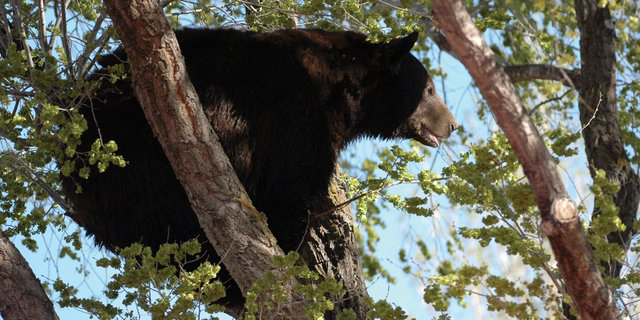 Local resident Marvin Cattoor took this photo Sunday of a male black bear in a tree near Ranney Street. The bear was later put down by Colorado State Parks and Wildlife officers. The bear’s remains have been donated to the Museum of Northwest Colorado for a future display and it is the hope of museum directors to recreate the scene as portrayed in the photo. A male bear euthanized Sunday in Craig by Colorado Parks and Wildlife officers will now be allowed to stay in town — as a display. Jan Gerber, assistant director of the Museum of Northwest Colorado, said Thursday that Bill de Vergie, Parks and Wildlife area wildlife manager in Meeker, contacted museum staff to know whether they’d be interested in accepting the bear’s remains as a donation. The bear sighting was first reported around 9 a.m. Sunday in the yard of Marvin and Robin Weible near the intersection of Third Street and Mack Lane. When Parks and Wildlife officers arrived on scene, the bear climbed to safety in a nearby tree. Two attempts were made to tranquilize the bear before it escaped to Woodbury Park. When officers realized the bear had already been tagged once for coming into contact with people, the decision was made to down the animal in accordance with the state’s “two strike” policy. After the encounter, Gerber said the bear was taken to Big Cat Taxidermy where it was skinned. The bear’s hide has since been sent out for tanning. When the hide returns from the tannery, museum directors will go to bid to have the bear mounted. Revenue from the museum’s mineral lease sales will fund the display, Gerber said. “We’re just treating it as another gift to the community,” she said. The desire is to recreate the photo taken by local resident Marvin Cattoor of the bear crouched in a tree on Ranney Street, Gerber said, but no final decisions have been made yet. Once complete, Gerber said the bear would be housed on the main floor of the museum near the recently added locked deer horns exhibit. Museum officials hope the display will be ready for public viewing in time for fall hunting season, but believe a more reasonable debut date will occur before the end of the year or during the first part of 2013.